Why have the same old run-of-the-mill office shindig? Why not try something different when thinking of office party ideas? At Inspire Day Spa in Scottsdale, we’ve hosted a number of office events. It truly is a fun, relaxing and wonderful way to spend an outing with colleagues and peers. Given our gorgeous lakeside location, not to mention the large open gathering spaces right outside our state-of-the-art facility, you know that your corporate event will certainly be something special this year! 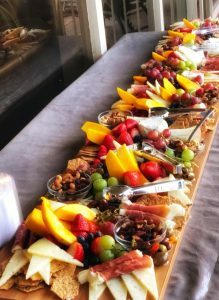 Beyond the array of relaxing and high quality spa features and services, we also offer cheeseboards and may be able to accommodate special requests. What better way to say thank you to a staff that has worked so very hard than with a spa retreat day which is certain to be remembered for a long time to come. So what type of activities and treatments can you offer at your office party…First off, Phoenix based Inspire Day Spa features a serene and calming relaxation room. This is an incredible place to meditate, or just gather and peacefully relax letting your cares simply melt away. Talk, laugh, experience real bonding time filled with fun and enjoyment. Of course, you can also treat your employees to massages or facials. What a tremendous break from the everyday of work. To be spoiled and pampered with a massage or one of our signature facials. They will certainly thank you! We know that our stunning lakeside setting is also an amazing plus for your corporate event. Picnic areas galore, you can sit and watch the birds and other indigenous wildlife. Enjoy walking the trail around the lake, some may even opt to bicycle. 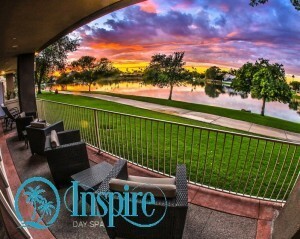 What other venue can offer an outdoor and indoor experience equal to what Scottsdale’s Inspire Day Spa can? Among The Best Office Party Ideas Yet! We would love to discuss your next corporate event and show you our deluxe facility—it truly is a peaceful and relaxing paradise. Sure, you can have your office party somewhere pretty routine, but that won’t make it memorable. An event at Inspire Day Spa or our sister spa in Phoenix: New Serenity Spa is like no other. Please don’t hesitate to contact us as you plan your next office function. We would be happy to show you a comprehensive list of what we offer and custom tailor a party around your needs and guest list.